is a starling-sized passerine bird that breeds in the northern forests of Eurasia and North America. It has mainly buff-grey plumage, black face markings and a pointed crest.  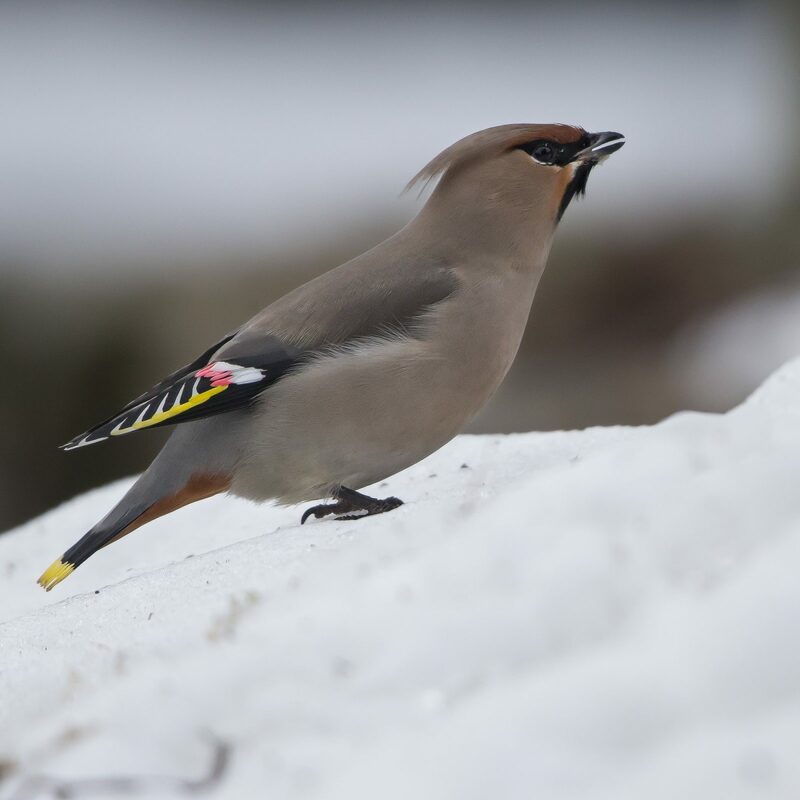 Its wings are patterned with white and bright yellow, and some feather tips have the red waxy appearance that give this species its English name. 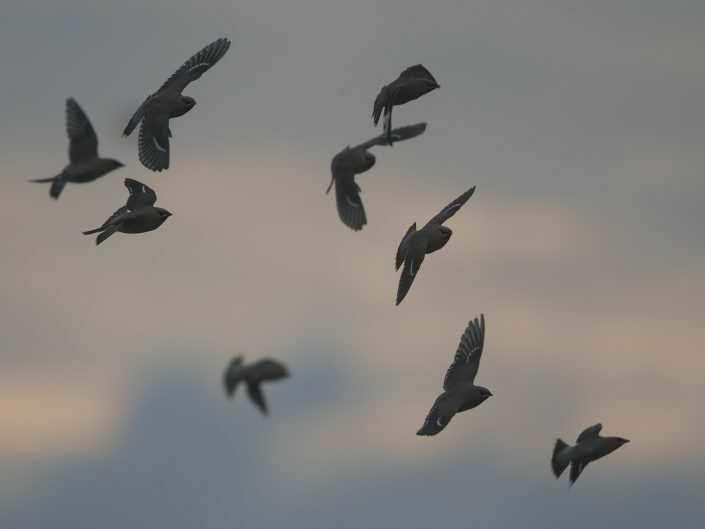 The three subspecies show only minor differences in appearance. 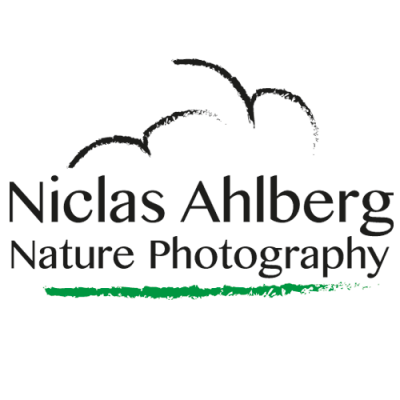 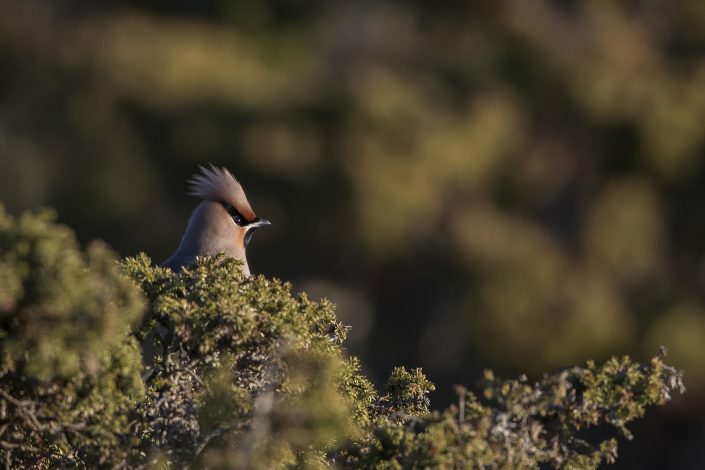 Females are similar to males, although young birds are less well-marked and have few or no waxy wingtips. 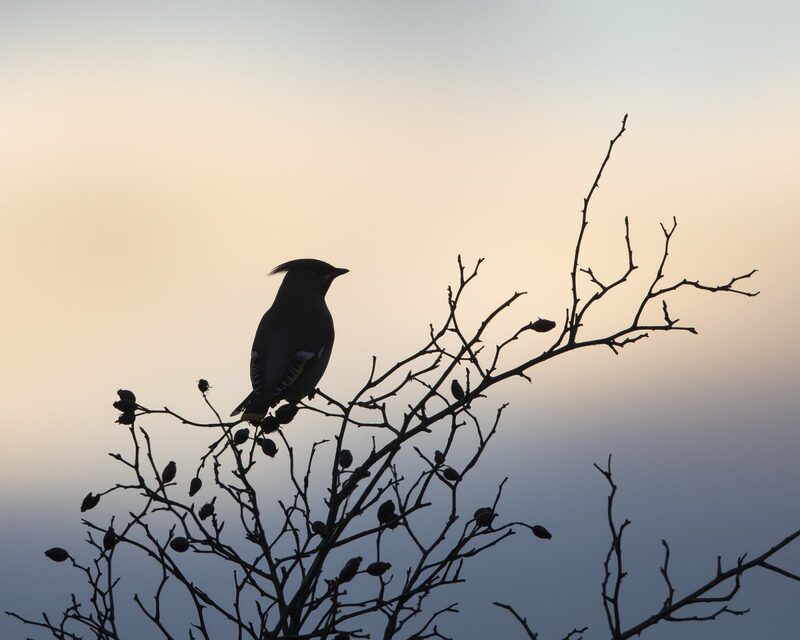 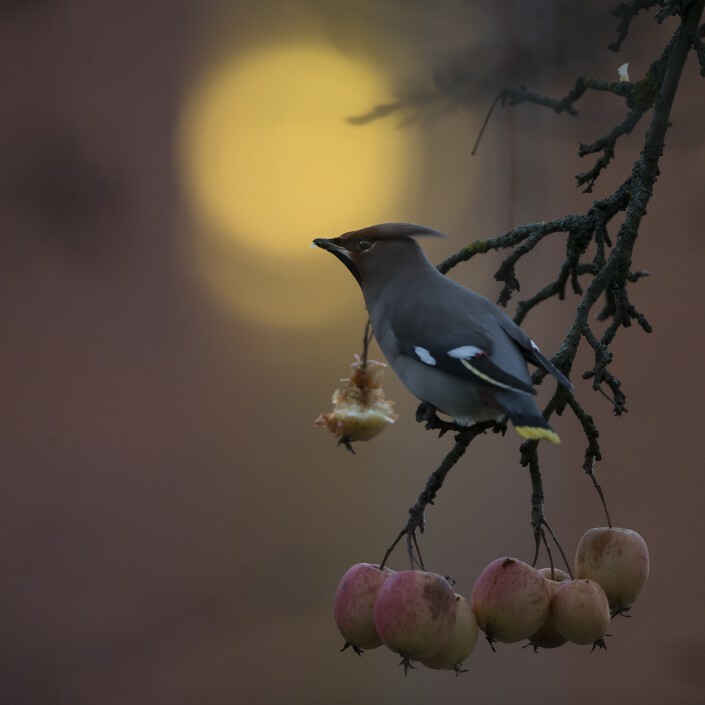 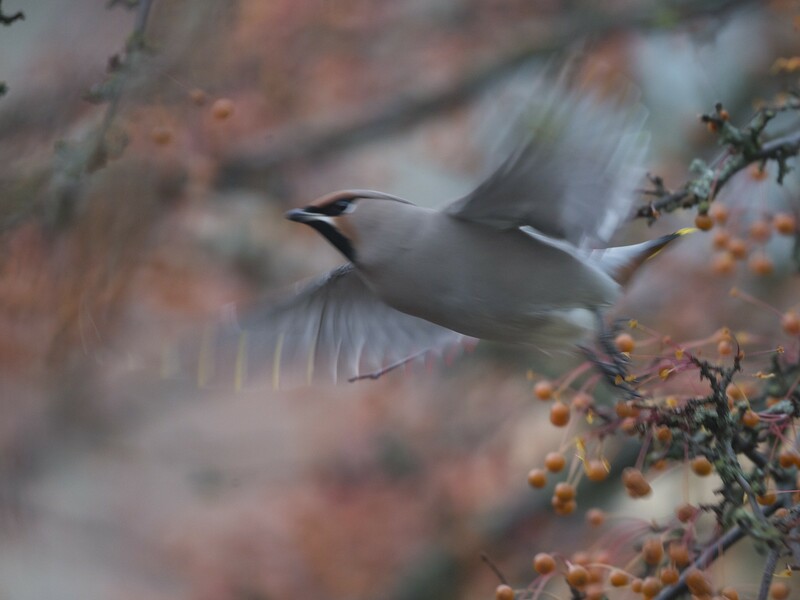 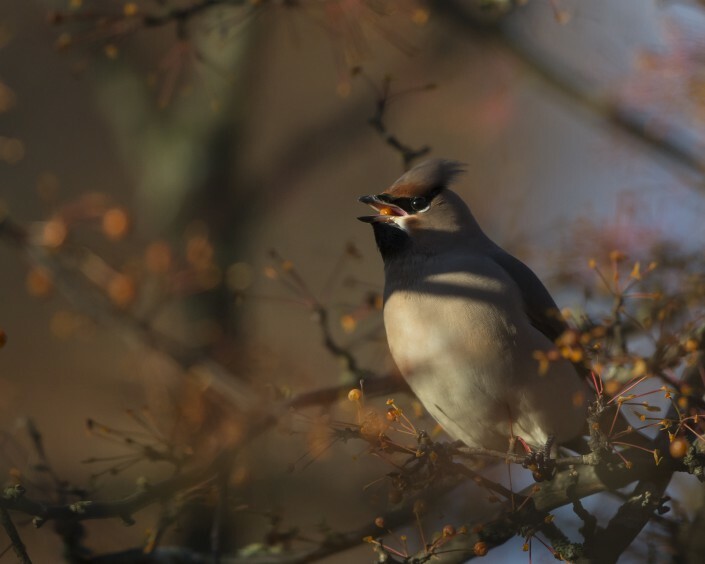 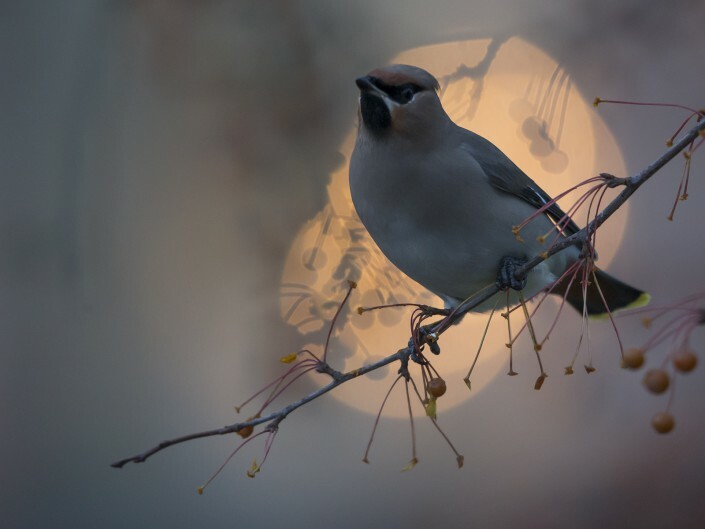 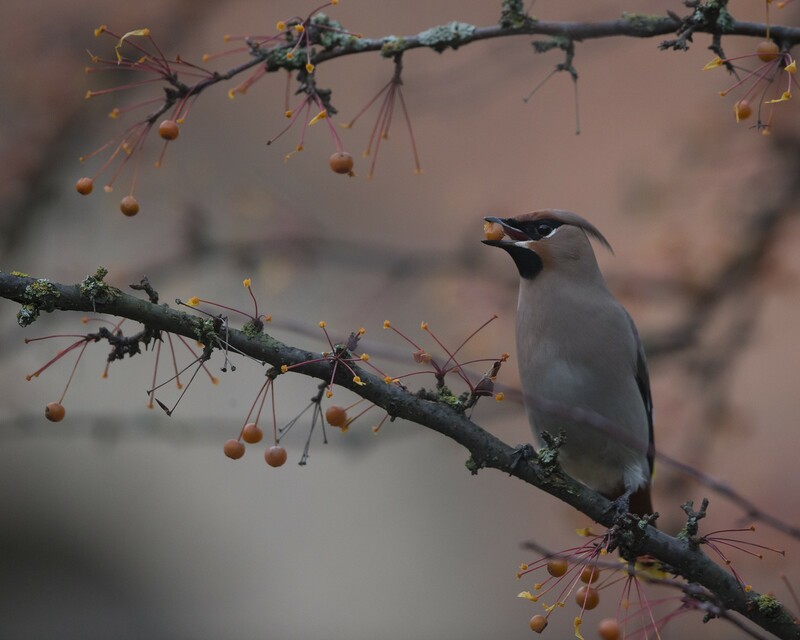 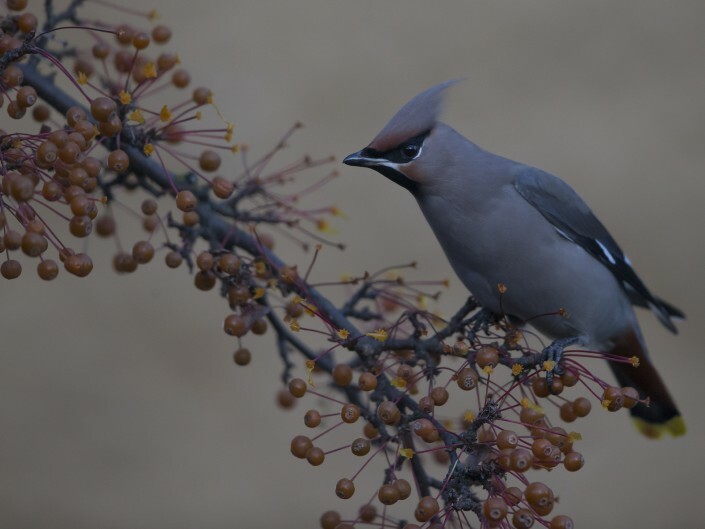 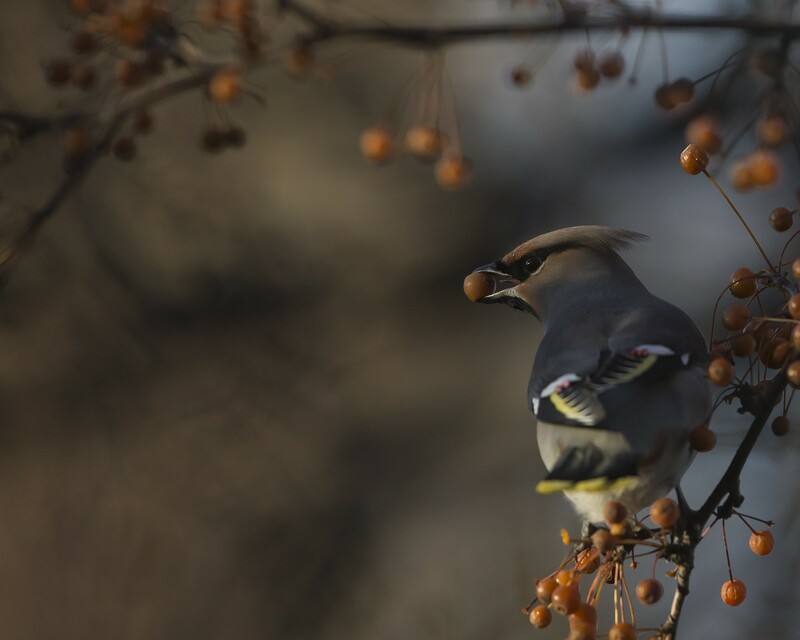 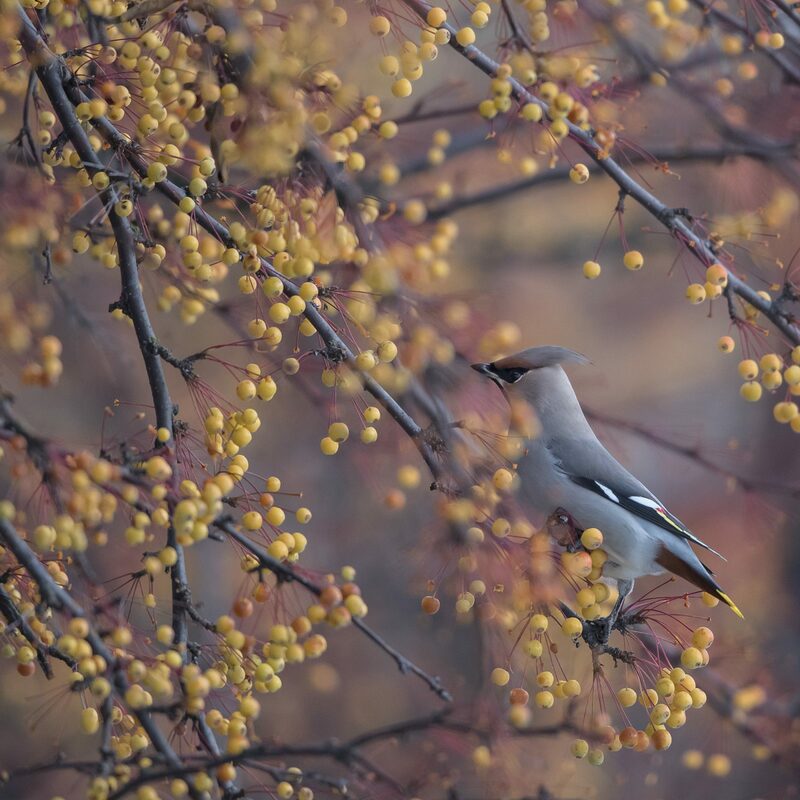 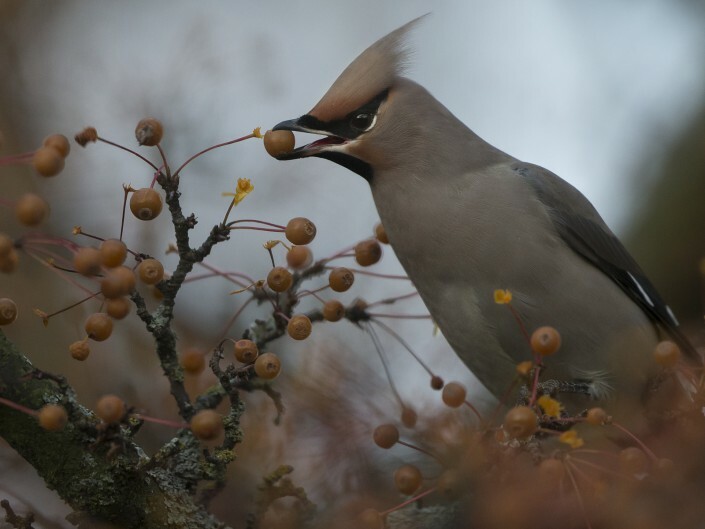 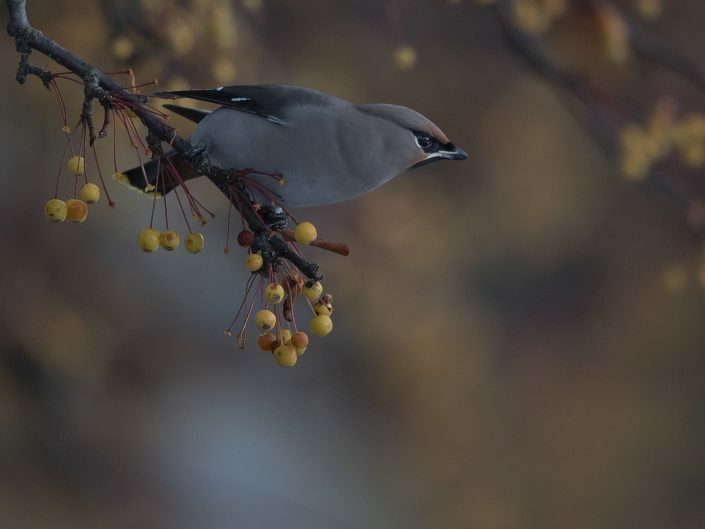 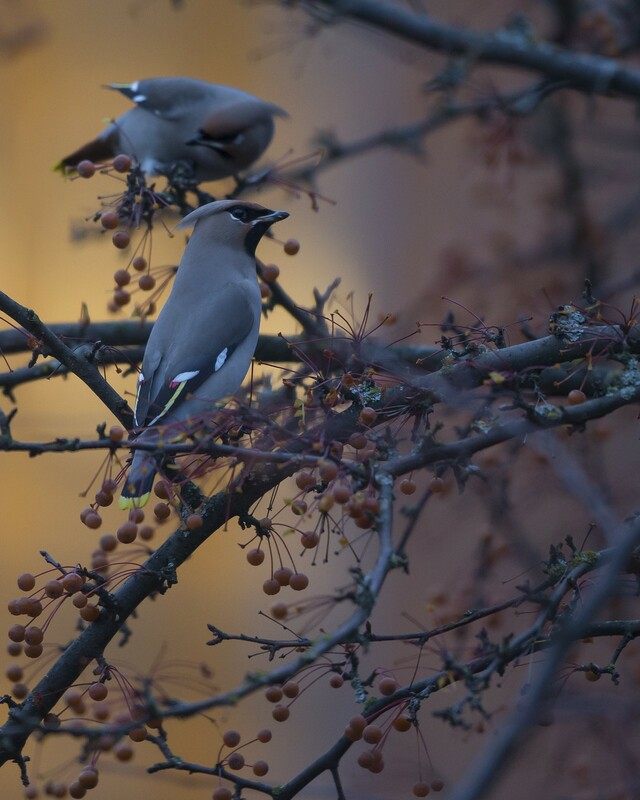 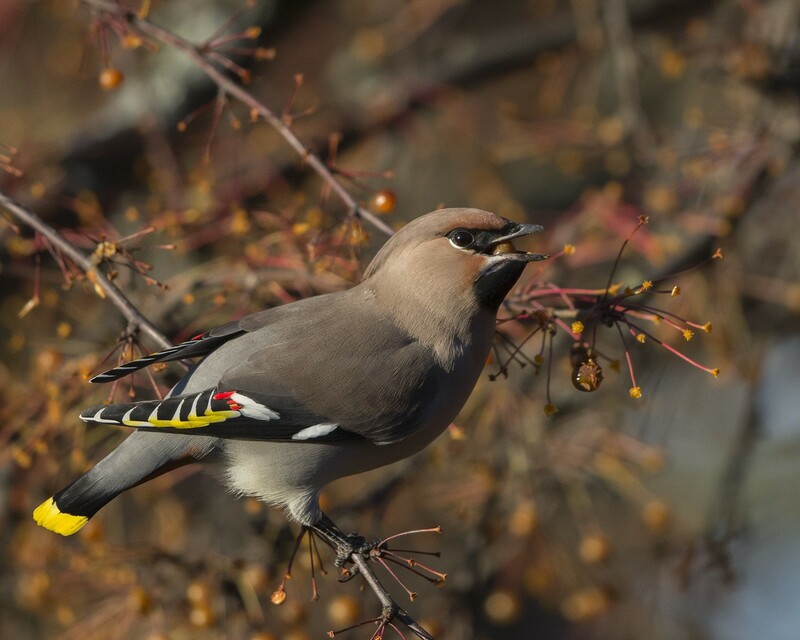 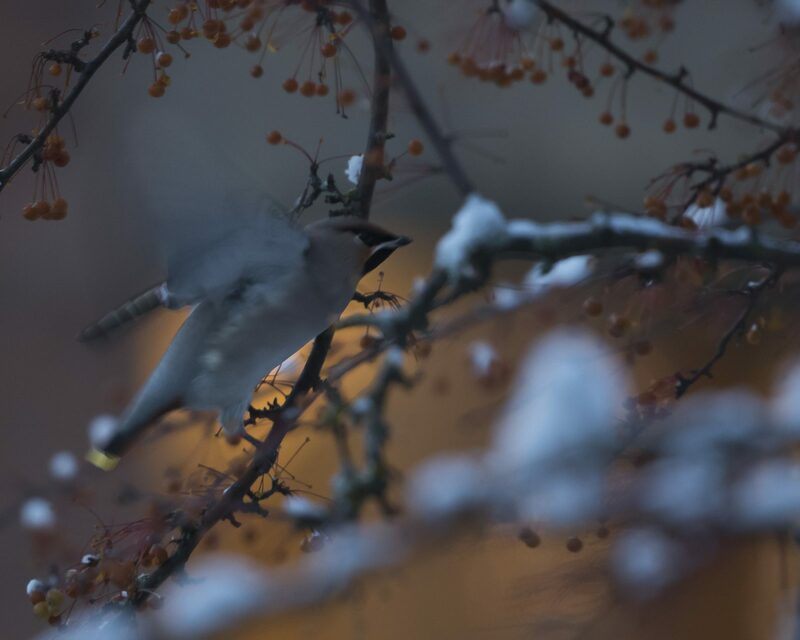 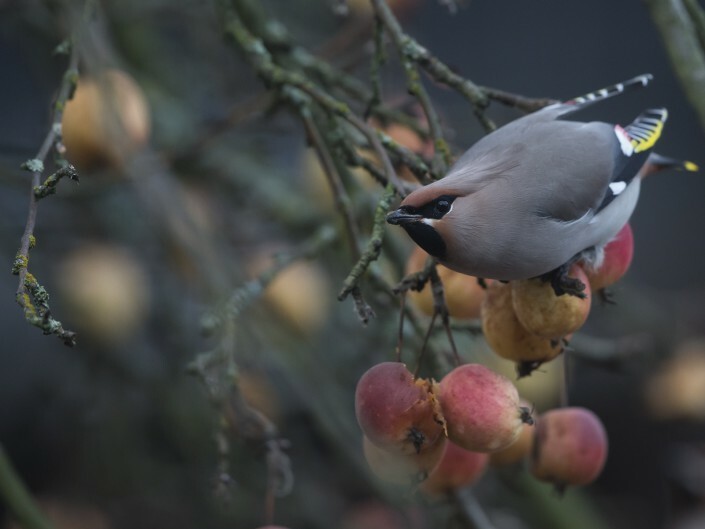 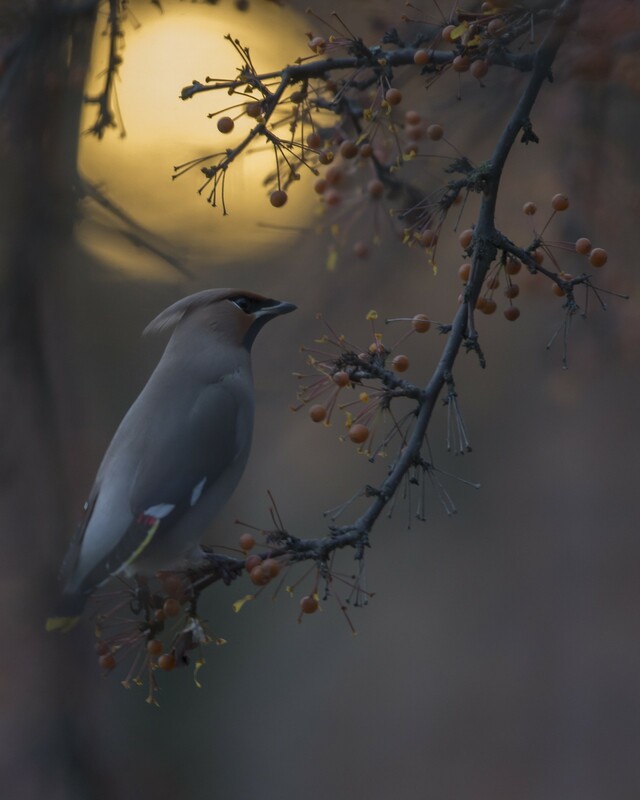 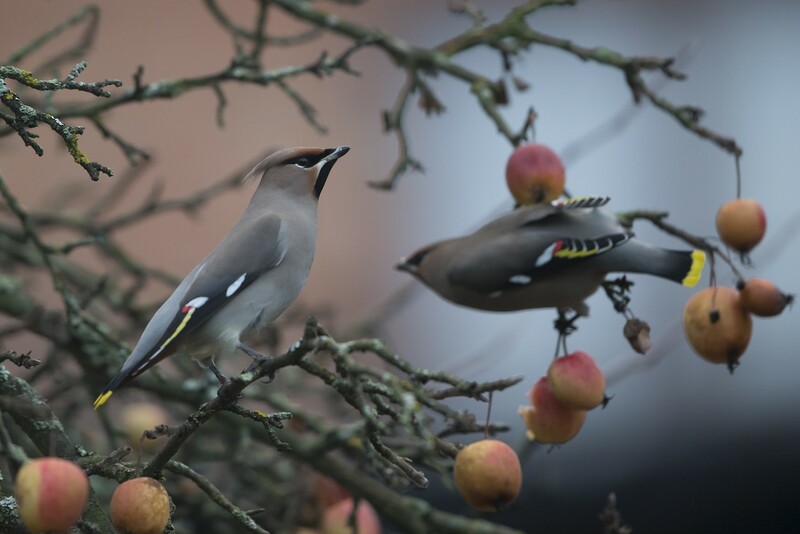 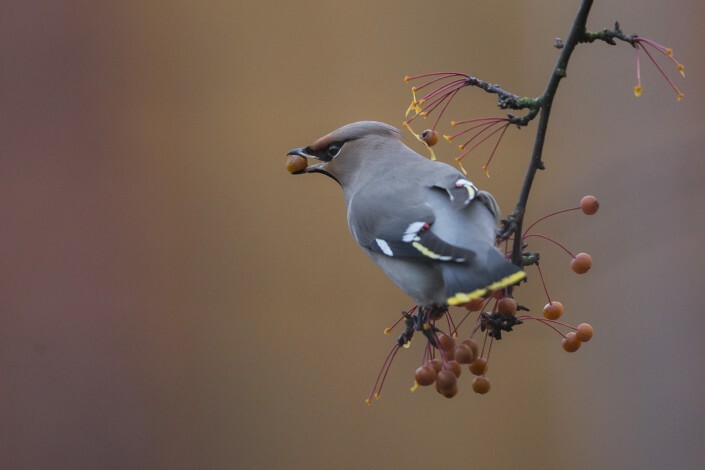 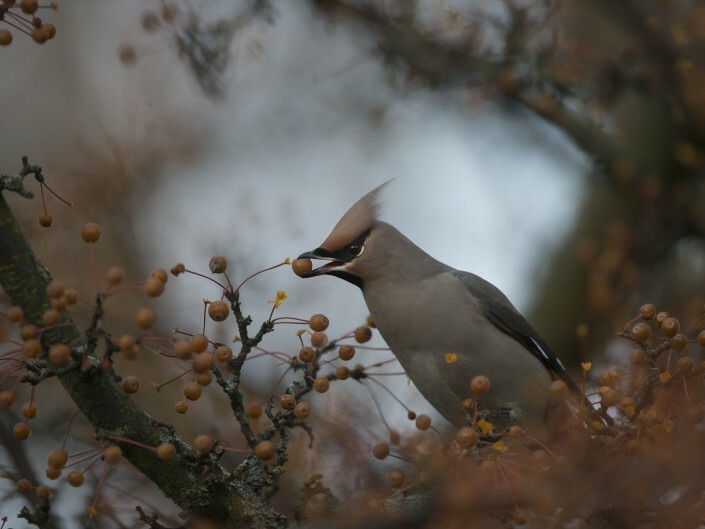 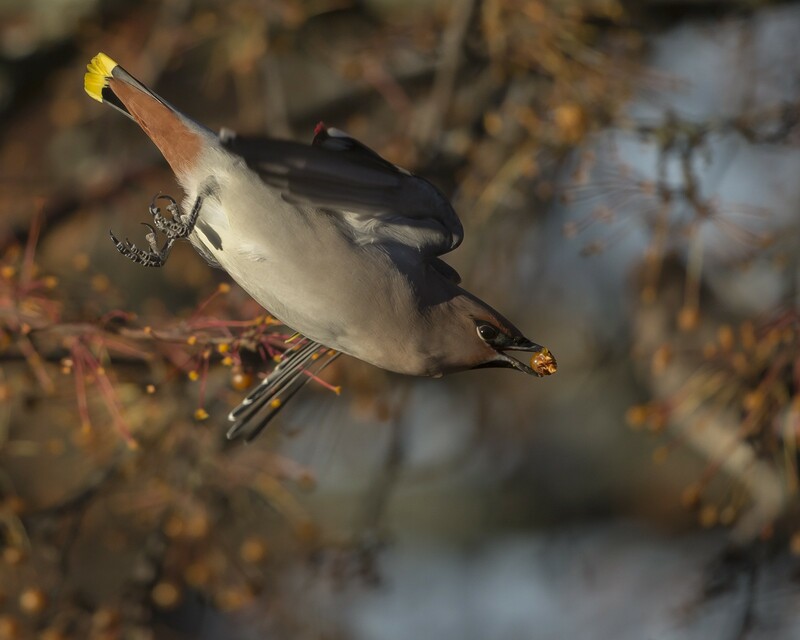 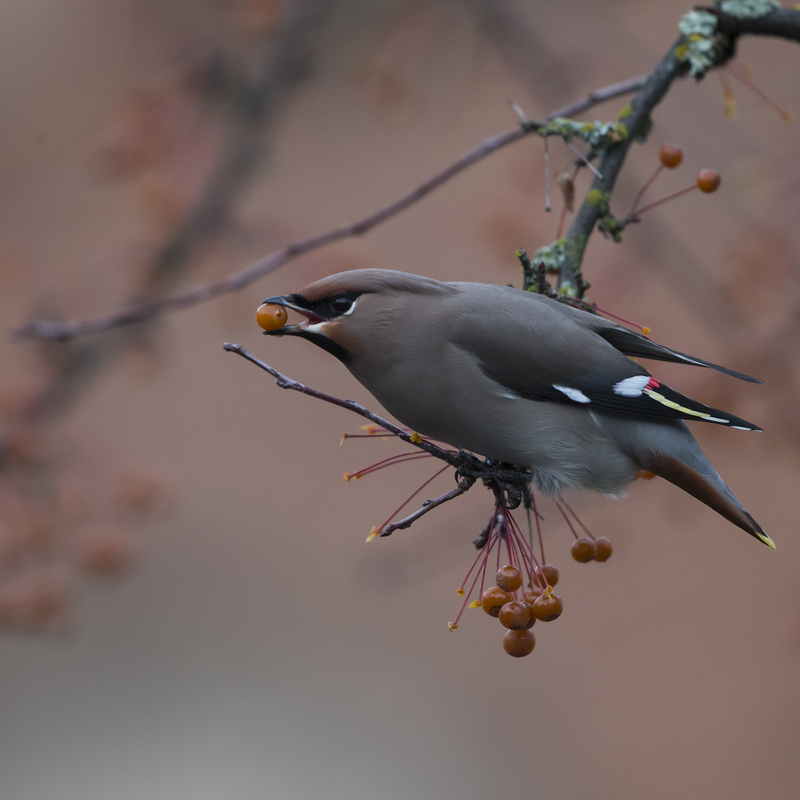 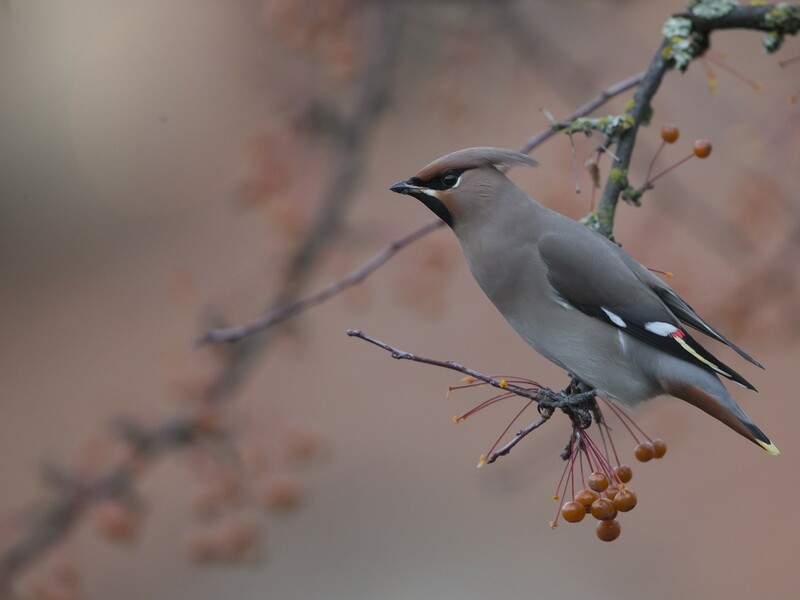 Waxwings are primarily fruit eaters, but also consume insects during the breeding season. Mosquitoes and midges are the most common prey, but many other insects and some spiders are eaten. 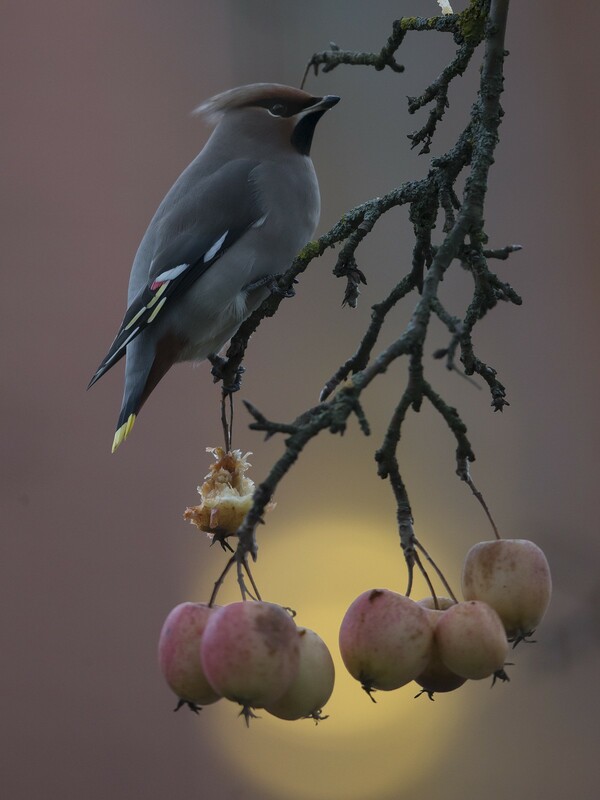 Waxwings are characterised by soft silky plumage. 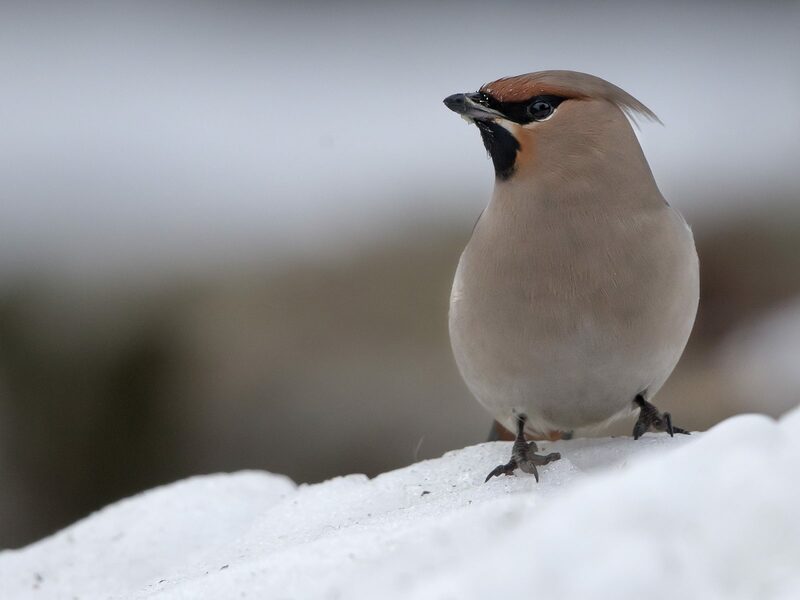 (Bombycilla, the genus name, is Vieillot’s attempt at Latin for “silktail”, translating the German name Seidenschwänze.) 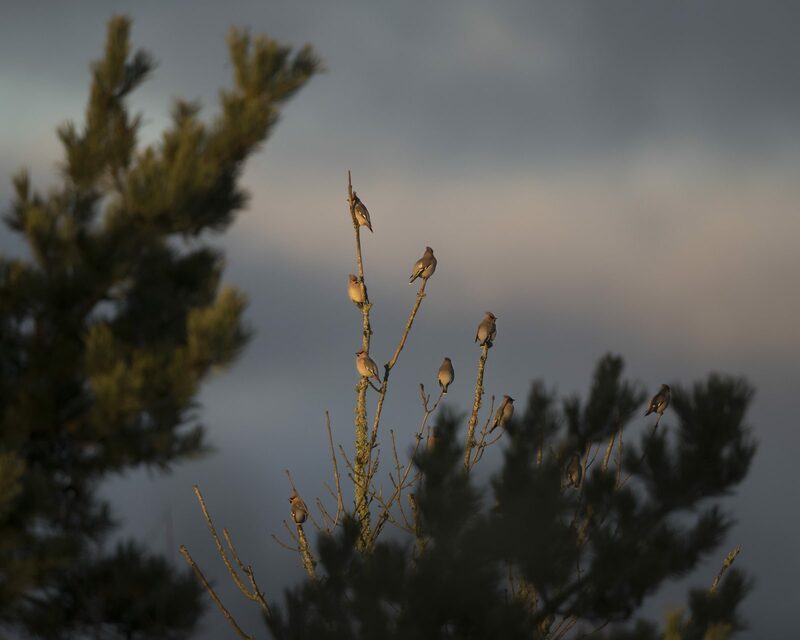 They have unique red tips to some of the wing feathers where the shafts extend beyond the barbs; in the Bohemian and cedar waxwings, these tips look like sealing wax, and give the group its common name. 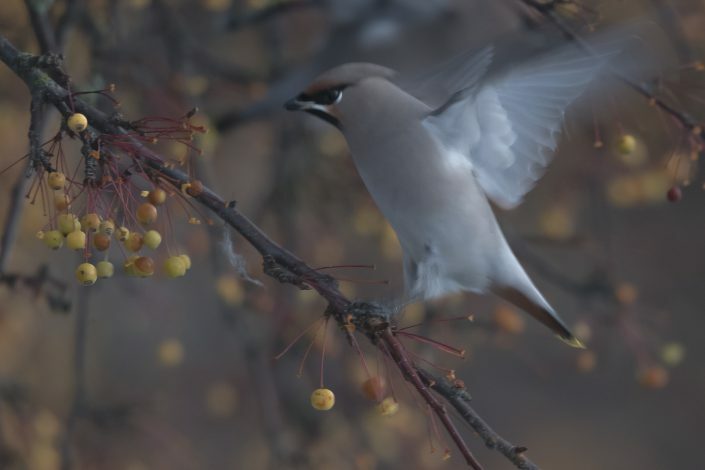 The legs are short and strong, and the wings are pointed. 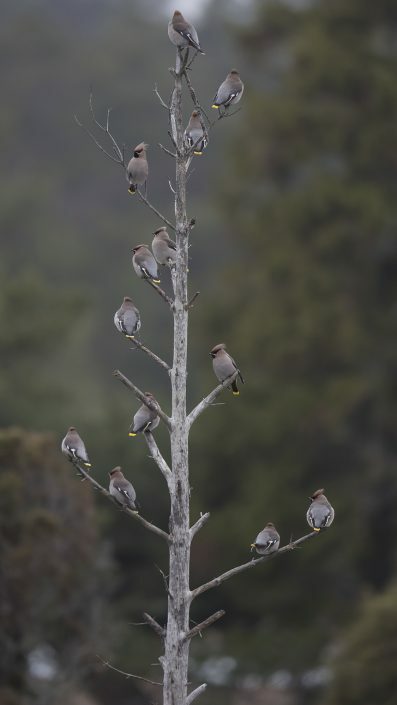 The male and female have the same plumage. All three species have mainly brown plumage, a black line through the eye and black under the chin, a square-ended tail with a red or yellow tip, and a pointed crest. The bill, eyes, and feet are dark. 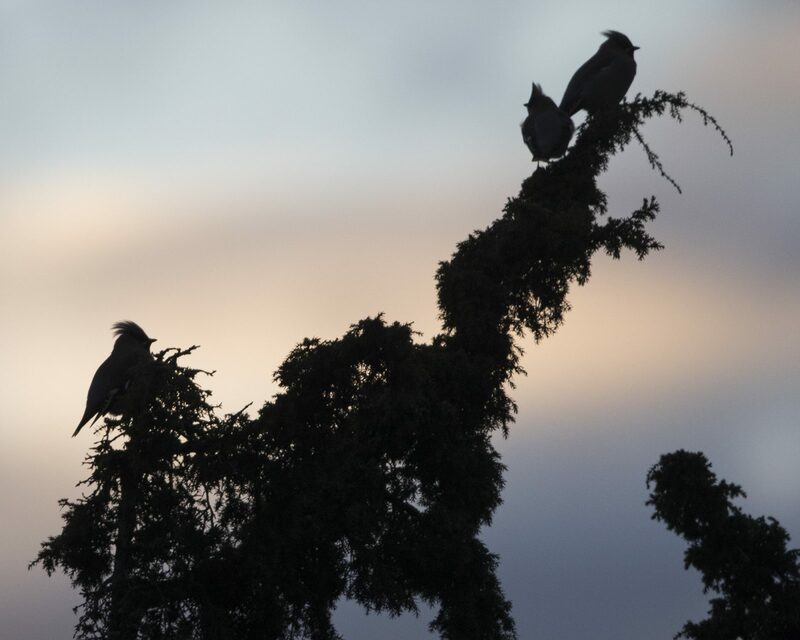 Calls are high-pitched, buzzing or trilling monosyllables.